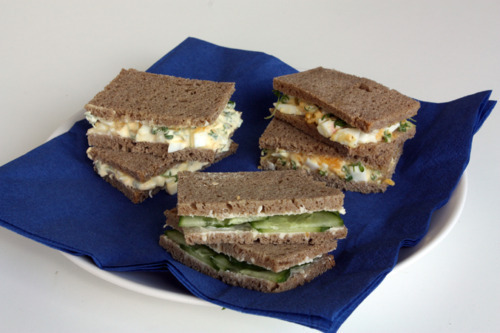 Continuing with the Jubilee theme this week, you can’t get more British than egg cress and cucumber sandwiches for afternoon tea. And they’re really simple to make. Personally, I prefer them with mayonnaise, but for a healthier option you can use creme fraiche, or half and half of each. I have found it works and tastes best with whole grain toast bread, but alas, there is no Genius gluten free bread in Germany, so I had to make do with wheat free rye bread instead. Fine chop up the hard boiled egg. Or, if you have an egg slicer, use that the slice the egg first one way then the other – it worked brilliantly for me. Mix the chopped egg with the mayonnaise/ creme fraiche and cress (we grew our own from seeds, it takes about a week), and season with the salt and pepper. Cut the crusts off your slices of bread, and butter each slice (the last bit is optional, I prefer mine buttered). 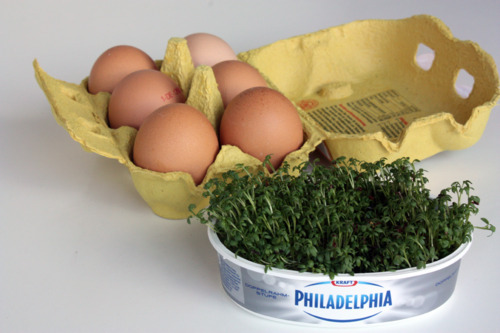 Spread the egg and cress mixture on to one slice, top with the other, then cut into canape sized squares. The cucumber sandwiches are even easier. Just use thinly sliced cucumber instead of the egg and cress and proceed as above (for the cucumber you will want to spread them with butter though, otherwise it will taste too dry). Now, go and put on a pot of Early Grey and have yourself some afternoon tea.